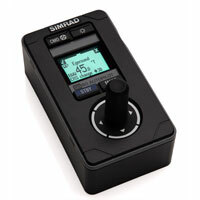 Click the button below to add the Simrad QS80 QuickStick Remote to your wish list. Enhance your heading control system with a choice of three full-function remote controls. Each has a 1.4 x 1.0 in/35 x 25 mm bonded display, are type-approved, and can be desktop or panel (flush) mounted. Fully waterproof (IPx6 & IPx7), these remotes can be installed in the best location for efficient operation. All remotes are easily networked, so installation is quick and simple with multiple remotes possible on one installation.